Had a been more prepared for this, I'd have knocked something up and printed it, but as it was I just wrote 3 copies. 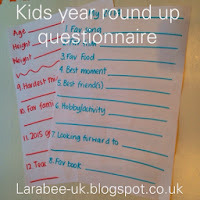 I asked The Teens to answer as many questions as they could, they actually spent longer on this than I expected, discussing some of the questions and reminiscing about things they had done separately at school. They also had a laugh with their Dad doing their weight and height, and helped T out. I also like the fact that we have their handwriting too, this is definitely something I'll be doing each year, I just wish I'd have done it sooner with them. 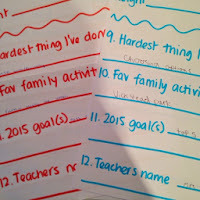 To help T, I gave him a few choices if he struggled for example for Best Moment, I gave him the options 1. Albert's birthday party 2. Meeting Peso 3. Going to Gullivers, 3 things I know he enjoyed but would never have been able to come up with on his own. Some questions were easy to answer with him, such as Hardest thing I've done, for T that was getting out of nappies, he looked really proud when I said that was the best thing he'd done this year! Likewise, his 2015 goal is to sleep in his own bed, I think he felt quite grown up having something to aim for himself. 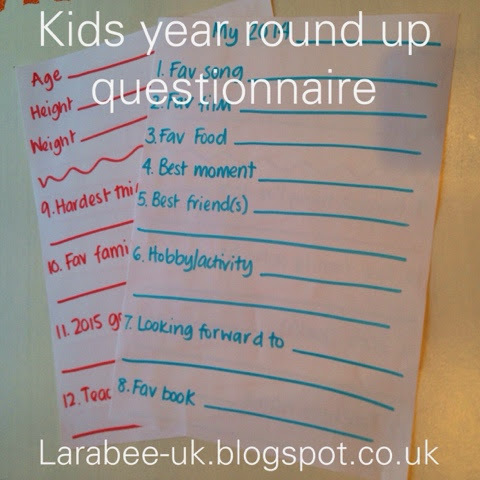 Questions such as Teachers Name, Best Friends, Age, Favourite food he was able to answer for himself. I liked the fact that all 3 children could do this together and that it's something that T will be able to do each year and we can look back on. Do you do something similar with your children? What sort of questions do you ask? How do you welcome the new year as a family? I'll be back soon to show you how we are storing these questionnaires.